Brandeis University Press, 9781512600483, 304pp. This absorbing biography chronicles the life and work of one of the most important entertainers of the twentieth century. Eddie Cantor (1892–1964) starred in theater, film, radio, and television. His immense popularity across a variety of media, his pride in his Jewish heritage, and his engagement with pressing political issues distinguished him from other headliners of his era. Paying equal attention to Cantor’s humor and politics, Weinstein documents his significance as a performer, philanthropist, and activist. Many show business figures quietly shed their Jewish backgrounds or did not call attention to the fact that they were Jewish. Cantor was different. He addressed the vital issues of his times, including acculturation, national identity, and antisemitism. He was especially forceful in opposing Nazism and paid a price for this activism in 1939, when a sponsor cancelled the actor’s radio program. 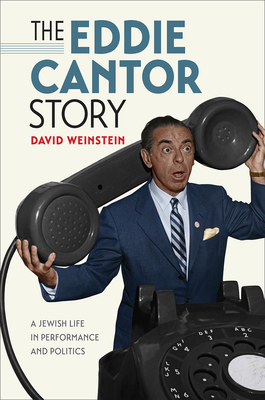 In this carefully researched book, Weinstein uncovers sketches and routines filled with Jewish phrases, allusions, jokes, songs, and stories. Cantor frequently did not mark this material as “Jewish,” relying instead on attentive audiences to interpret his coded performances. Illustrated with thirty photographs, The Eddie Cantor Story examines the evolution, impact, and legacy of Cantor’s performance style. His music and comedy not only shaped the history of popular entertainment, but also provide a foundation for ongoing efforts to redefine Jewish culture and build community in contemporary America. DAVID WEINSTEIN is a senior program officer at the National Endowment for the Humanities. He holds a PhD in American studies, has taught at the University of Maryland and George Mason University, and is the author of The Forgotten Network: DuMont and the Birth of American Television. He lives in Rockville, Maryland, with his wife and two daughters.